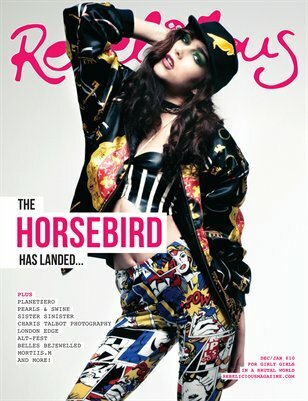 Welcome to issue #10 of Rebelicious Magazine! In our last issue of 2012, we head onwards and northwards for an interview with Anthony Kaye; the 'stablemaster' of Manchester's newest and finest clothing label Horsebird. Big things are going to be happening with that label in 2013, and we've got an exclusive insight into their story! We also bring you interviews with the likes of Belles Bejewelled, Pearls & Swine, PlanetZero, Mortiis.M, Sister Sinister, Charis Talbot Photography, we reveal our top albums from 2012 in Volume, we give you our top five alt fashion heels and nail styles, plus we explore the world of latex wearing that they never mentioned in the Matrix. Trust me, you'll wanna read that if you're thinking of buying latex for the first time!